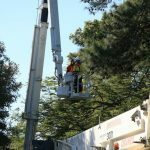 When a tree has problems, it is important to come to a decision on whether to trim or remove the tree. Trees have a lot of benefits such as making your house beautiful, giving shade to your property and it can also increase the value of your property. Trees also help to hold the soil in place and help with climate moderation. 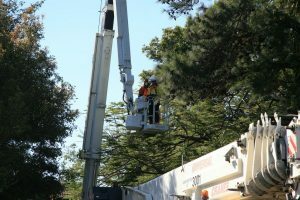 If you, therefore need to tree trimming or cutting services, you have to weigh the pros and the cons before making a decision concerning the tree. If the tree has diseased parts, you can call an expert to trim away all the dead parts and you can keep watering the plant. With time, the tree will grow back properly. If the tree has some dead branches, the dead branches should be trimmed. Dead branches can cause harm to people and damage property. Once they are removed, the tree has the chances of growing back well. Remove rubbing and crossed branches as well as narrow branch angles that are prone to getting split. If the tree is severely damaged and the chances are that the damage cannot be corrected, it should be removed. 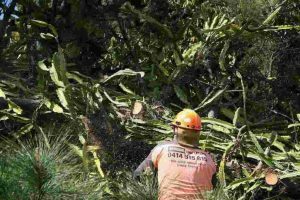 If the tree has weak wood that gets damaged often, has shallow root or drops a large amount of debris that is capable of damaging pavements and lawns, you should consider removing the tree. A tree whose trunk is severely damaged with lots of dead branches, vertical cracks and large wounds is an indication that the tree is internally damaged. The chances that such a tree will heal is not high, therefore such a tree should be removed. 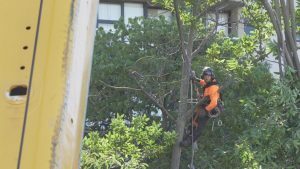 You should call a tree expert to assess the tree before making a decision. Having dead branches on just one side of your tree is very dangerous as it will make the tree lopsided. This might be as a result of trunk or root damage to the side of the tree that has all the dead branches and such a tree should be removed. If the tree also starts leaning suddenly, this could be an indication of the weakening of its roots and should be immediately removed to avoid causing damage to property and the people around. 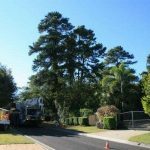 When an excavation is carried out near your tree or some new form of construction is carried out near it, majority of the root of the tree can get damaged in the process, when this occurs, it is best to remove the tree. At times, you will notice small branches coming out at the base of the tree. This will let you know that the tree is responding to severe stress. 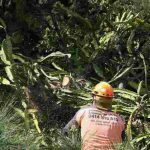 If you have any questions regarding the health of your tree, tree trimming services, or anything tree related, please don’t hesitate to contact us!